There is nothing like garden fresh tomatoes. I love roasting them under the broiler, topping them with fresh mozzarella cheese and a bit of basil, and having nothing but that for lunch! (see my recipe here). But I have found an even better way to snack on tomatoes and it’s awfully convenient, too!!! TOMATO CHIPS!!! 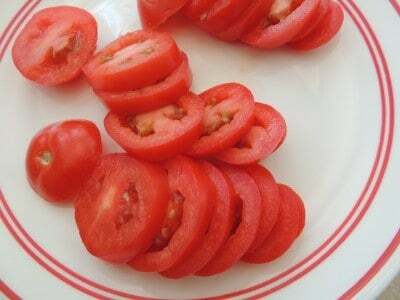 If you’ve never had a tomato chip, but love the taste of tomatoes, you have yet to fully live your life! They are THAT GOOD! and YES, if you don’t have a dehydrator, you really should buy one. I’m trying to encourage everyone to grow something, preserve something, and put back something when it comes to food sources this year. Dehydrating is one of the easiest ways to preserve food because it doesn’t require the time commitment of canning or the freezer space of freezing. You just pop it in, dry it, and store. I even heard of some folks who serve these with dips but I gotta tell ya, the sweetness of the chip combined with the light saltiness of the sea salt and hint of extra flavor from basil are all I need. This is one of those snacks that has so much flavor it is intensely satisfying – more than a potato chip ever hopes to be! And think of how much healthier it is, too! (I keep a mason jar of tomato chips by my chair where they stay nice and crispy just waiting on me to eat them throughout the day!). I’ve currently planted 2 Roma tomato plants at my house and 4 at my mothers, just to make more chips this summer! But any tomato will do, I just find the size of Romas to be the most convenient. All you’re gonna need (besides a dehydrator) is Roma tomatoes (others would work also, but smaller ones are better), sea salt or kosher salt (something coarse), and dried basil. Yup, I bought these tomatoes because Romas are not in season yet. But the nature of food blogging means I have to bring you these recipes early enough so that you have them when Romas are in season 🙂 These came from Sam’s and they were really good though. Slice your tomatoes, with the skin on, about 1/4 inch thick. Ehh..that looks closer to 1/2 inch…so aim for 1/4 but if you end up hitting 1/2 keep on walking and don’t look back. 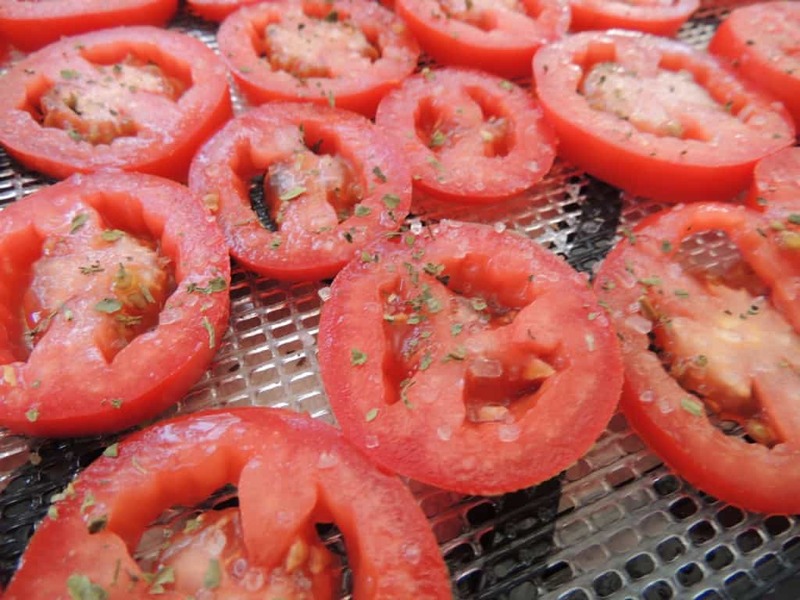 Arrange slices on a dehydrator tray. Sprinkle them with sea salt or kosher salt (You want a coarser salt) and a bit of dried basil. Go easy on the salt because whatever you add will taste like double once the chips are dried. Set dehydrator to vegetable temperature, around 135 degrees, and dry until crispy, anywhere from 8-12 hours. Store in airtight container and enjoy!!! Get ready to make some more though, because these won’t last long. A dehydrator is an excellent investment to allow families to preserve food with little fuss and to also make wonderful snacks – even “real” fruit snacks for your kids! To purchase one of the dehydrators like I have, click here to see the 9 tray and click here to see the 5 tray. Submitted by Carolyn Tyler. Click here to submit your own. Okay, that’s it. I’m buying a dehydrator. I keep seeing all these ideas and want to try some. My son has been wanting to make deer jerky so he’ll be happy. Any advise on brands? Brenda, I would recommend the Excaliber series. They have 4, 5 & 9 tray models. I purchased the 4, not knowing if I would keep using it. Mine is running day and night!! Wish I’d gotten the 5 or 9 even! Seeing the tomato chips pushed me over the edge also! Finished my 3rd batch the other day. Anyway, after careful research, I chose this one 1) most reviews I read said they wished they had purchased this instead, 2) there is no pole going up thru the center which cuts down on drying area like there are in the round ones and 3) the fan and heater are on the back side of the dryer so it dryers all shelves evenly…no need to shuffle your drying trays. My next adventure will be drying salmon! Can’t wait to see how that works vs. smoking it. Good luck and have fun drying!! I bought the Nesco Professional hydrator and it mentions blanching (steam or microwave) most vegetables before drying. Doesn’t look like you did that in your illustration? I guess it will just take longer to dry, but the blanching is more prep time so think I will try w/o. Also I didn’t have dried basil, only fresh, so I used dried oregano. I do not blanch any of mine Kathy. If you don’t have a dehydrater, can you use your oven? Lovin’ all of these dehydrating recipes! Looks so yummy! I’m putting roma tomatoes on my shopping list now! I hope you enjoy Leslie!! Sounds like heaven to me. I LOVE tomatoes and have lots of them planted in my garden for this summer. Also found a second hand dehydrator with 6 or 7 shelves for only $10 and it works great! Now, suggestions on how to dehydrate my fresh basil and I’m all set. Thanx so much for these postings. I dehydrate all sorts of herbs, and never have used a dehydrator for that! I usually bunch the herbs up like a bouquet, tie the ends, I use elastic bands because the stems shrink, and if you are sneaky you can save those little hooks that the socks and other things have when you buy them, thread the thin elastic band through the hole and then use the elastic to tie the bottoms of the stems together, hang the whole bundle upside down and let dry, if you have a lot of dust, you can take tulle or netting (finest holes in the netting) and cut a large circle about 12-18 inches across depending on your herb height. Run a pocket around the outside edge with a sewing machine and put in a drawstring, lay the herbs down with the ends of the stems sticking out over the edge a bit, pull up the drawstring carefully and tie up tight and hang the bunches to dry. A tip for those without gardens, buy organic herbs when you see them especially if on sale (I got three bunches of lovely Italian flat leaf parsley for the price of one) dry them and crumble them for dried herbs. Unfortunately we don’t get a lot of bunch herbs here so have to grow them. Christy, can you recommend a good dehydrator? I LOVE MY EXCALIBUR Dehydrators! I have two: a five tray and a nine tray. That is the link to it and I also have a 5 tray with a timer. I LOVE THEM! These look delish! I bet my Mom has a dehydrator – going to call her right now! You are my hero! Fresh tomatoes are my favorite summertime thing – I don’t care if folks call them a fruit or a vegetable, fresh ‘maters are wonderful. I can’t wait to try these, gonna find somewhere around my patio to plant a few Roma’s. By the way, love Southern Plate’s new look! What kind of dehydrator do you have Christie ? Kristie, we also do this and vary the spices. Try Italian Seasoning, Garlic Salt or Powder (Garlic Herb blends are really good -even those without salt) or Oregano – your imagination is the limit! Also, try using grape tomatoes – they seem to have even more flavor. You can just cut the grape or cherry tomatoes in half. We kind of squish out the seeds or at least some of the seeds. 🙂 They can also be thrown in sauces when cooking to add flavor. In the summertime, when we are drowning in cherry and grape tomatoes, we just throw the extras on the dehydrator to make the tomato chips. Oh, great idea Dawn, thank you so much for sharing! I dehydrate my excess cherry tomatoes and then when they are crispy dry, throw them in a spice grinder or small food processor and make tomato powder. Use it in soups and sauces..or in place of tomato paste….it is amazing stuff. I will never throw any tomatoes out again. will this work for potatoes, too? I am ordering a dehydrator today! You can definitely dehydrate potatoes!! I hope I can do one as well Barbara!! Just bought a Dehydrator, have dehydrated Banana Chips and Pineapple so far, couldn’t get my Banana Chips crisp, it was on for about 24 hrs. Any idea. Also love all you dehydrator recipes, keep it up please. A lot of those banana chips you buy in store have been fried, so they are crisp because of that. Mine are crisp, but a little bit tough to chew, almost like a crisp taffy. The kids love them though! Katy takes them to school for a snack several days a week, when we manage to have some she hasn’t eaten right out of the jar at home! Stay tuned for an upcoming posts with lots of fun things you can do with banana chips! You’re not cheap, just practical! This is something new to you and I completely understand not wanting to sink that kind of money into it, because I was the same way. I started out with a dehydrator much like this one: http://www.amazon.com/gp/product/B000LNVUJQ/ref=as_li_ss_tl?ie=UTF8&camp=1789&creative=390957&creativeASIN=B000LNVUJQ&linkCode=as2&tag=christyssouthernplate-20 And used that for a few years. When I upgraded to an Excalibur this past Christmas, I passed that one on to a friend and it is still going strong! We just planted 65 tomato plants this week, 40 of which are Romas. I make my own salsa, spaghetti sauce, stewed tomatoes and this year will be trying some tomato chips. These look yummy. I also plant and dehydrate my own basil so will use that on my chips. Yum! Thank you for all your yummy recipes! Oh my goodness!!! 65 plants!!! WOW!! A friend of mine dehydrates lots of veggies, and grinds them into powder. She adds them to soups, stews, and lots of sauces. I think that that is a fabulous idea if you have family members like I do that won’t touch a squash. Imagine the possibilities of getting more veggies into their diet! I always add V-8 juice to meat loaf and use oat meal instead of bread crumbs. I hope that it makes it a healthier dish. So thank you Christy for the info on the dehydrator, I am getting one for sure! I have been saving your recipes on ziplist for a long time. I went to the site this morning and only 1 recipe is there! Can you find out what happened or if I did something please? I am not sure what could have happened, maybe you accidentally logged out? You can contact ZipList @ziplist.com and see if they can help you. I don’t have a dehydrator, but what also works extremely well is slicing small cherry tomatoes in half, sprinkling a bit of sugar and salt on top and drying them in the oven for some time. 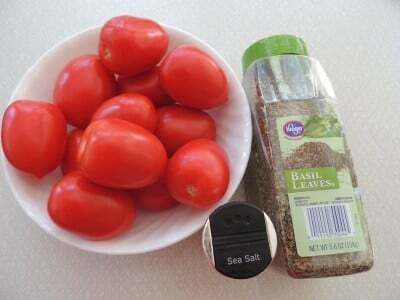 I like to add a tiny bit of sugar because it really brings out the tomato flavor in combination with the salt. I’ll have to try these as well! 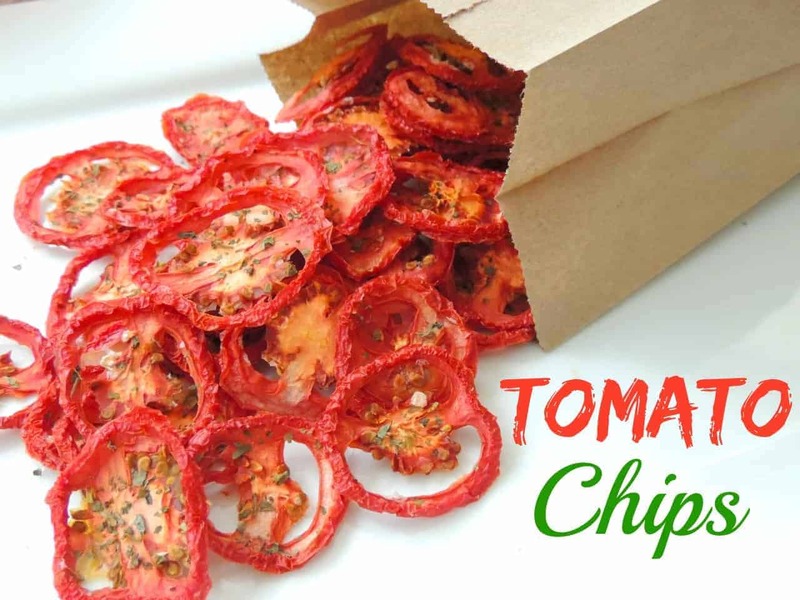 Who needs potato chips when you can have these scrumptious tomato chips? Thanks for this recipe. I’m so glad I saw this recipe, as I had a bunch of tomatoes that were getting pretty soft. I have those going in my dehydrator right now. Can’t wait to try them. The brand I have is American Harvest and it works like a charm. I’ve had it for several years, but still works great. It makes WONDERFUL jerky and I use the recipe that came in the book with the machine. I love the idea of using garlic and Italian spice. Will try on the next batch. I love your site and your cookbook, Christy. Thank you so much Val, I am so glad you are enjoying the site and books!! 🙂 Yes, you do!! They are so good!! I just have to tell you I took my 1st batch out of the my dehydrator this morning and they are AWESOME!! I started another batch this time with just salt and pepper I cant wait to try them. Thank you for sharing this! Well, who knew that I needed a dehydrator??!! LOL! Didn’t until I saw these tomatoes! I’ve planted a bunch of them so this will be another great way to use them. And being able to store them so easy is a win-win. My new Excaliber is on order as we speak. You’ve inspired a new adventure in cooking for me. Thanks! You are going to love it Linde!! I can’t wait to hear about all the things you make!! You’re right, Christy! I DO love it! I’ve done frozen peas, frozen corn, fresh red and green peppers, cilantro, sweet potatoes chips for my 2 dogs (they crazy love them…nutritious and no additives! 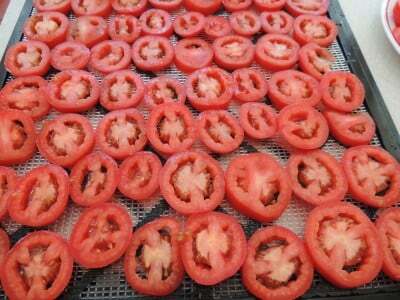 ), frozen spinach and three batches of these amazing tomato chips! My next adventure will be salmon jerky! I’ve smoked lots of salmon and love it but am really looking forward to trying this. My dryer is running day and night! My only regret is that I didn’t purchase a larger Excaliber! Anyway, thanks again for the inspiration and great ideas! Could a microwave be used to dehydrate the tomatoes. I use the microwave to make dehydrated celery leaves. Works great, but you do have to watch them closely,. Please let me know if I can use the microwave for the great sounding recipe. I have never made them using the microwave but I would love to hear how they turn out if you try it!! I bought a cheap dehydrator just to see if I would get into this or not. After making these yummy tomato chips ut oh, I may upgrade. These taste like a little splash of pizza sauce in your mouth. Thanks so much for sharing. I am so glad you liked them Wendy!! I can’t stay away from them! Mine are in the dehydrator right now!! !Hope they are as good as I think they are gonna be!!! I hope you love them Martha! !